OMG, nearly a whole month of Halloween decorating complete. This week sees a `Trick or Treat`, an image from Jade Dragonne on Deviant Art. I am not sure how I feel about this design...it was almost a little to complex for the size and it was difficult to colour the detail. 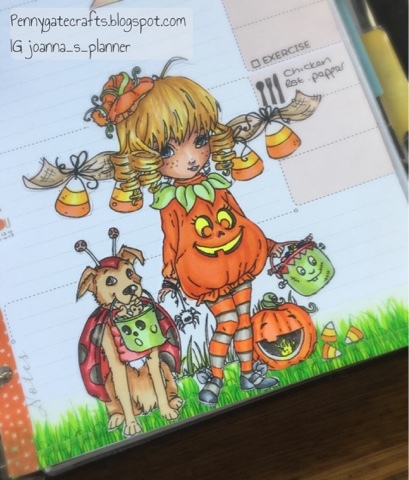 I think I would approach the whole design differently if I were to colour it again, but then the whole point of my planner is to ensure I practice my colouring skills at least once a week in order to learn and develop. The little girl in the pumpkin outfit was a particular challenge as I really couldn`t decide what she had on her head. It took some serious searching to work out it was the top of the pumpkin. Silly really because it makes sense when you think about it. I am not sure what is going on with the ribbon and the candy corn but it is a pleasing image. Now candy corn...that is is a mystery to me. It is not something we have here in the UK but Halloween seems flooded with it. I haven`t yet worked out the link between the two, or, if it is coincidental that this sweet is more available at this time of year, I have to say I am fascinated by what it might taste like...it looks like something Haribo might make but flavour???? I mean what flavour is corn? Please feel free to leave a comment I would love to know...I have a feeling it might be vanilla? 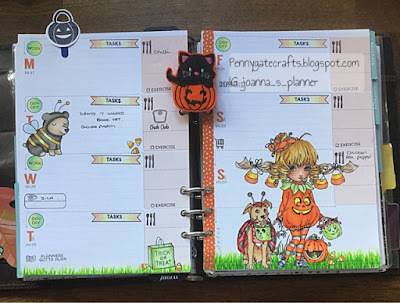 The other images this week are from Lawn Fawn...they always have something seasonal that will work well in a planner, but best of all I can get them in the UK. 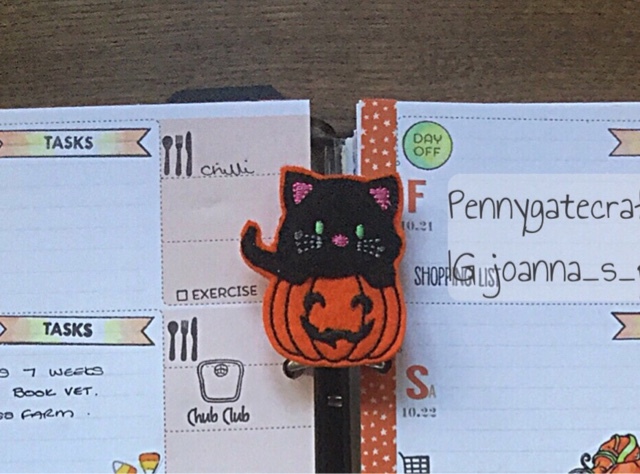 Functional stamps are from Studio L2E, Tiny Stamps Big Plans & Technique Tuesday. 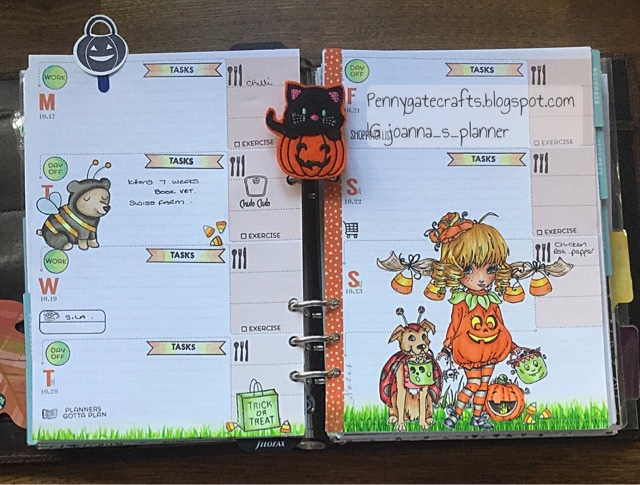 Check out my new Halloween planner clip from Cherry Blossom in the Market Square. 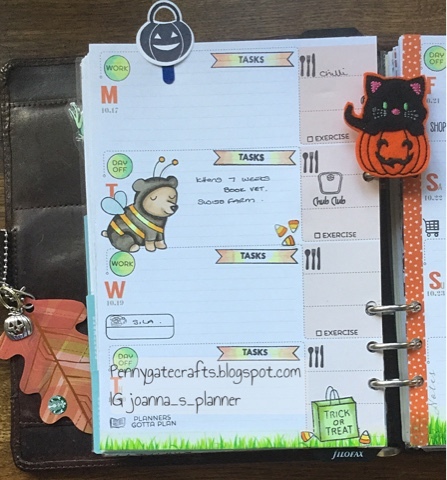 This is a fabulous quality clip and sits very flat in the planner. I have some foxy ones too but they are for another day.